For the last few years I’ve lugged a big backpack around the ISTE Conference. The backpack contained all the tech I “thought” I needed for the conference: Laptop, speakers, chargers, power cords, camera, cables, adaptors, batteries. All in all it came to about 15 -20 pounds. By the end of the day it seemed more like 50. 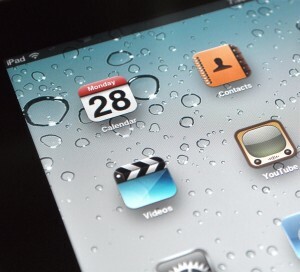 This year I wanted to see if I could get by with just my phone and my iPad – no backpack. Turns out it worked. I was able to check e-mail, Tweet out during sessions, check Facebook, and take notes. With my phone I was able to snap pictures and grab QR Codes. I even carried a mini charger in my pocket just in case, but I never needed it. I also picked up some great apps that were shared by others at the conference. Here are the three coolest ones. 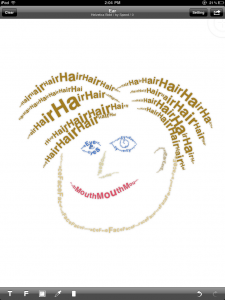 To put it simply, Type Drawing is drawing with words. 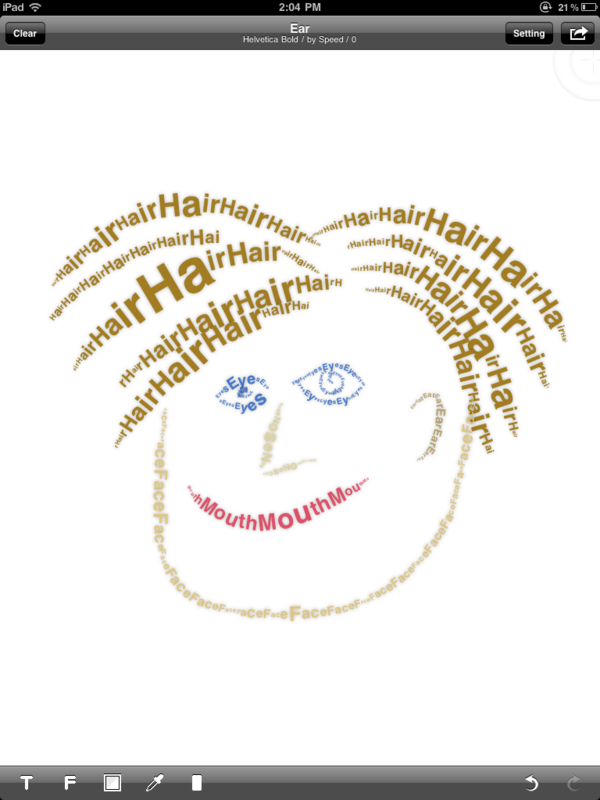 You type in a word, then draw with it. The faster you draw the bigger the letters. Draw slowly and the letters get really tiny. By changing words and colors you can get some really interesting creations. Imagine telling kids to make a picture with their spelling words. Thanks to Bridget Belardi for sharing this. 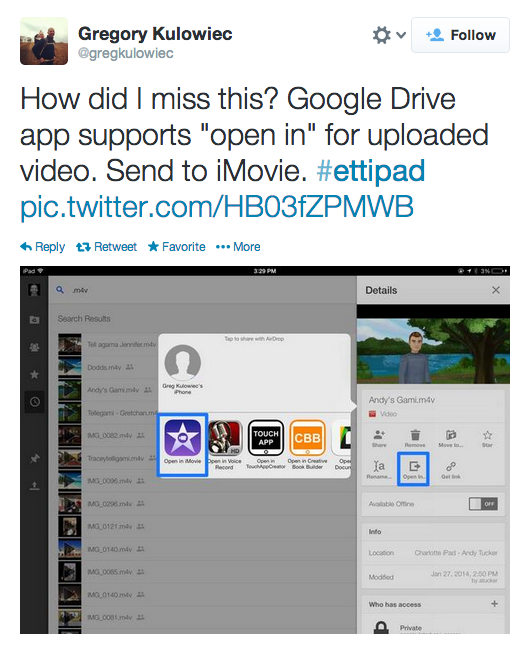 Kevin Honeycutt shared this at one of his sessions. 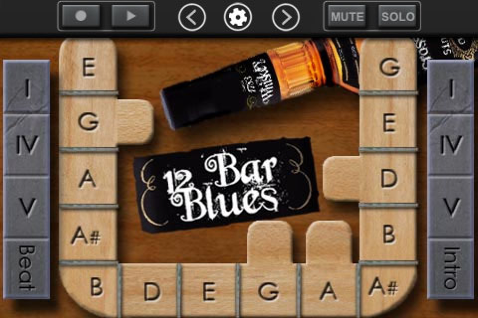 Sure it’s got a digital piano and drums, but what grabbed my attention was it’s feature that lets you create and play your own 12 Bar Blues. Watching Kevin create a simple blues song in just minutes was enough to tell me I HAD to have this. By the way, if you ever get a chance to hear Kevin speak, DO IT. You won’t be disappointed. I was happy that his was my final session at ISTE. I left energized and inspired. Thanks again to Bridget for showing me this gem. Noteshelf is the best app I’ve seen for note taking on the iPad. It lets you write notes, quickly and easily. It has a zoom feature that helps you write small to fit more info on one page. If you want to make your notes look “cute” there’s a pull down box with hundreds of little smileys and icons for jazzing up your note pages. 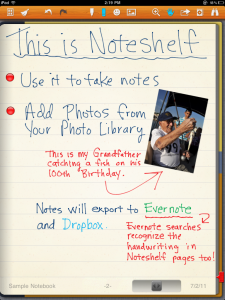 Noteshelf also lets you bring in pictures from your iPad photo library. 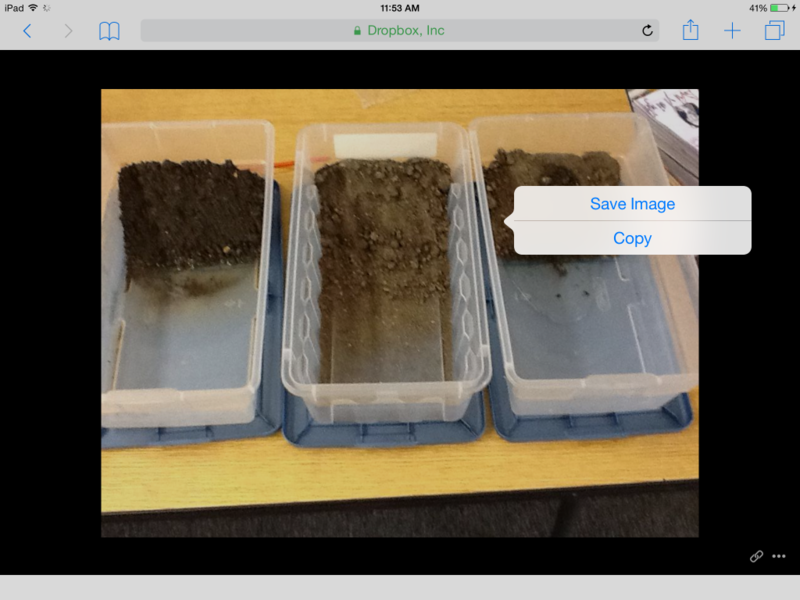 Using multi-touch, those images can be moved, resized, and rotated. For handwriting notes on an iPad you really need a stylus. I picked up a little Pogo Sketch stylus at Amazon.com for under $10. Noteshelf has a “wrist protection” feature that lets you rest your wrist on the iPad while taking handwritten notes. I tried it. It works. The best part about Noteshelf is that it connects to the cloud. 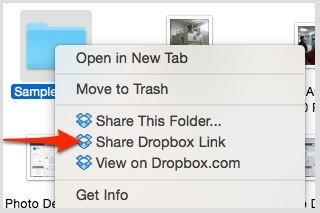 Notes you take can be uploaded to Dropbox or Evernote. I tested it by creating the note below, sending that note to Evernote. Once it’s in Evernote your handwriting is searchable. I was able to search for keywords and it recognized my writing. I really want to use Evernote more, but for me note taking means writing and Evernote doesn’t let me do that. Now that I can write my notes with Noteshelf, send them to Evernote, and search what I’ve written I’ll be using this powerful cloud tool much more. Jumping on the iPad Bandwagon? Earlier this year, a large prominent high school in Orange County announced that next Fall every student would be using iPads. In the past few weeks, three other schools in my area have announced that they are going one to one with iPads next year as well. This has no doubt created a buzz around my school from both students and parents asking if or when WE will be going to iPads. Should we? I don’t know. In 2008 our middle school went 1:1. For us, the time was right. We had been using mobile laptop carts for the better part of four years. Our teachers and students were familiar with the software, and the demand for more time with the laptops to work on class activities and projects surpassed the availability of the carts. Three years later, all of our middle school students and teachers use tablet PC’s. They all have the same software and use the same tools for assignments and projects, and we have admin rights. We have control. We have also had to hire extra staff to deal with support, warranty & accidental damage issues, and to do anything on the student machines that require administrative access. There have been some issues, but it’s worked pretty well for us so far. If we were to try to implement this same program today, I’m not sure we could pull it off. Too many kids already have some sort of device, netbook, tablet, or laptop. We would be in the awkward position of having to tell parents, “Hey, you know that computer you just bought your kid? Well, they won’t be able to use it at school. Instead, you MUST buy the one WE require you to use.” Sounds kind of ridiculous, if not a little arrogant, saying that if you’re child is going to be able to learn at our school that they MUST have this device. Currently most of the work our students do is saved on their computer. From Office docs, to PhotoStory and MovieMaker projects, to OneNote notebooks, everything is saved in their “My Documents” folders. Kids are responsible for backing up their own documents, photos, and music. How many do you think actually do that? What happens when their computer gets dropped, or they spill a Pepsi on their machine? They get a loaner computer to use while theirs is repaired, but if they didn’t back up their stuff, in many cases that assignment or project is lost and needs to be redone. Online tools like Google Docs, Voicethread, EDU Glogster, Aviary, Moodle, and many others do not save student work in their My Documents folder, but rather on the Internet. By saving to the Internet, or rather “the cloud”, work can be accessed anywhere and the computer becomes less a device to store your stuff and more a device used to access and work on your stuff. If your device gets dropped in the pool, your stuff is safe. Just get another device, sign in, and your back in business. We’re already using several different web tools with our students. As we move more and more to cloud based apps and storage, the need for a specific device becomes less important – along with the need to manage that device and make sure each device has the same OS or software. What’s important is that the device you have, whatever that device may be, enables you to access and work on “your stuff”. For some students that might mean they use a small tablet. For others it could mean a full blown 17” laptop. Students could choose the device that best fits their learning style. Sure, iPads are cool, but I’d bet if you asked every kid there would be more than a few who would prefer to use something different. Purchasing and servicing student devices would become the responsibility of the students and the parents. The school would just need to have a few loaner devices available for students who have “issues”. Just like you have extra textbooks in the back of your room now. Is the iPad Just Déjà vu All Over Again? As I said before, I think the iPad is an incredibly powerful tool for learning, but as I look at those middle schools and high schools jumping in and going one to one with iPads, it looks like the same thing we do right now, just with a different device. Everyone, regardless of preference or learning style, is still required to use the same device with the same apps. What happens when the next hot new device comes along? If I’m right, and the cloud computing trend continues, then doesn’t the device become less important? Wouldn’t we be better off getting our schools, teachers, and students prepared to work with any device? Our students would learn how to use, troubleshoot, and be productive with a device and tools that fit their own personal learning style. Our administration and IT would get out of the computer sales and support business and focus efforts and budget on providing a solid, high-bandwidth wireless network at school. And our teachers would focus on designing projects and activities that have the same academic requirements but allow students a choice of tools. When we ask them to write, we don’t tell them what kind of pen, pencil or paper to use, do we? Blog Challenge #1: Write about your life as a reader. NOTE: I tend to take writing prompts in a somewhat skewed direction. I know this might not be exactly what the challenge is asking me to write about, but hey it’s MY blog. That’s right. I’m an iPad. Of course I’m talented, versatile, and everybody wants me. 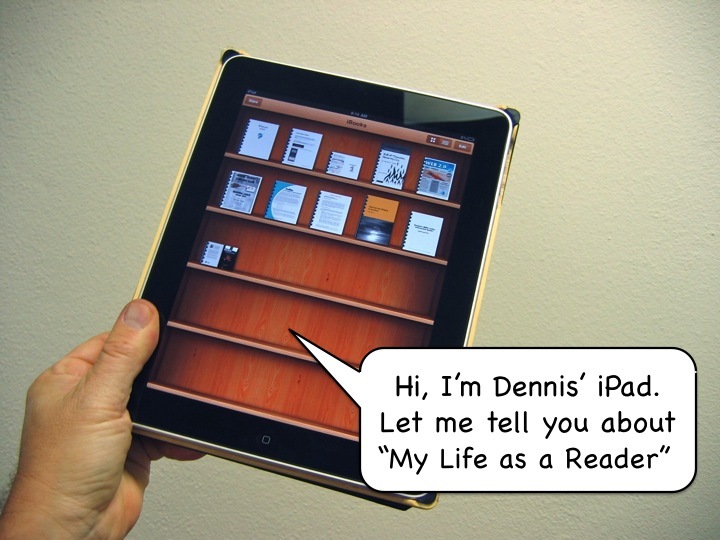 But for this blog post today I want to focus on “My Life as a Reader” – eReader that is. My free iBooks app is a good way to buy novels for reading in your spare time, but you did you know you don’t have to buy books from the iTunes store in order to use it? Just about any PDF file can be added to my bookshelves. This is pretty simple to do. 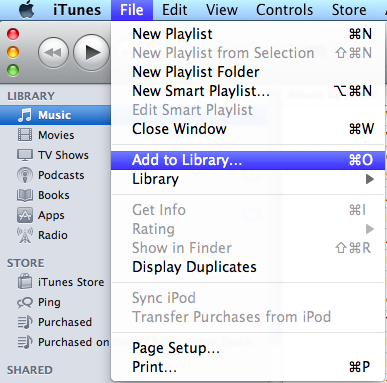 Just add the PDF file you want to your iTunes Library. When you click on BOOKS in your iTunes library, you’ll see the PDF file you added listed there. 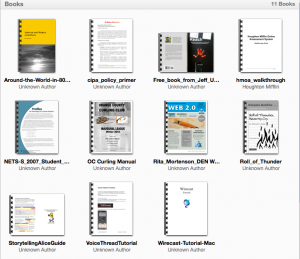 Load all your PDF manuals on your iPad. Dennis has found it pretty convenient to flip through pages of software and product manuals on the iPad rather than printing them out or flipping back and fourth between windows on his computer. Free public domain eBooks are available online. Sites like Planet eBook and PlanetPDF have many public domain titles available for download. Our 6th grade teacher is using “Around the World in 80 Days” for literature class. Kids can go online to these sites and download it for free. 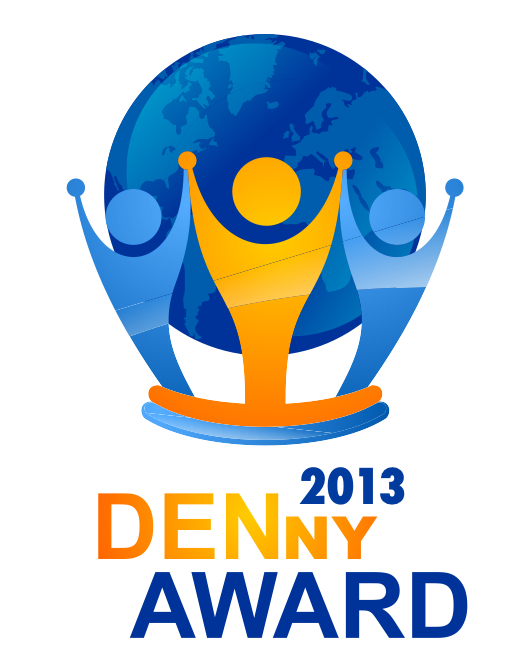 Upload copies of your own documents or things you just want to have handy. Dennis has loaded several PDF’s of documents and resources like the NET-S Profiles for Students and a few others. If he needs it quick, the iPad is definately faster than waiting for the computer to boot up. As you can see, my “Life as a Reader” is full of possibilities. Give it a try. Then you can go back to playing Angry Birds.